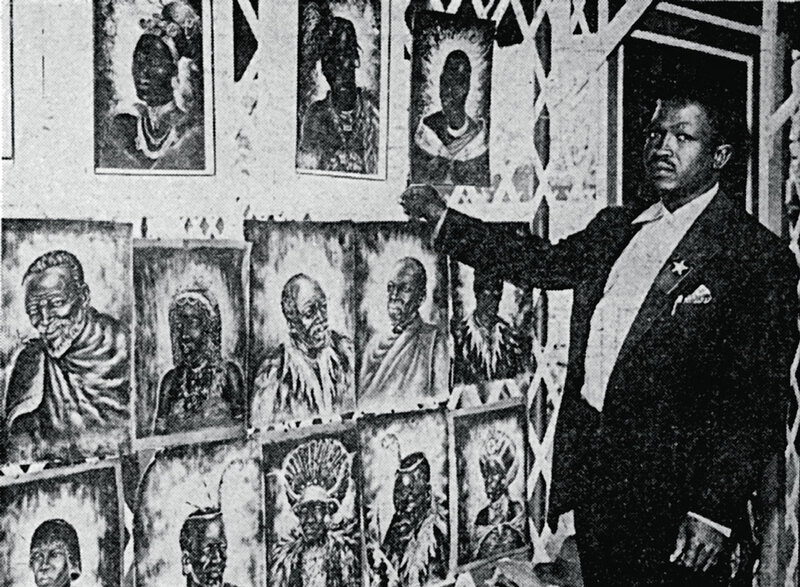 As a schoolboy in the former Transvaal, Maseko was fond of drawing. When he left school he initially began work as a house painter for an interior decorator. He was intrigued by the paintings and the framed reproductions that he saw in the homes of his employer’s clients and was inspired to take up artistic painting of his own. He acquired watercolours and oil paints and taught himself by reading and acquiring books on art and painting techniques, notably Max Doerner’s classic, The Materials of the Artist, first published in 1934. He then gave up house painting in favour of hand-painting designs on scarves for sale in a small shop. Here he was discovered by John Koenakeefe Mohl (1903–1985) (qv.) Mohl encouraged him to take painting more seriously and showed him some basic painting techniques which gave him more confidence. He later exhibited jointly with Mohl at Johannesburg’s Apollo Gallery in 1963. Maseko was later inspired by a book written by H.J. Groenewald on creative approaches to working on leather. This resulted in a period of experiment with staining, painting and embossing imported modelling hide. The result was a series of paintings executed on leather, one of which is Man smoking a Xhosa-style pipe (1960), (plate 38). The use of pronouncedly blue tones as highlights on the skin of the man in this painting, as well as the golden yellow hue of its background, suggests the possible influence of the kitsch ‘ethnic portraits’ of the popular South African painter Vladimir Tretchikoff (born 1913) whose work Maseko might have seen in the commercially-available framed reproductions in the white households where he worked as a house painter. The non-specificity of the beadwork configurations and other elements in this portrait make the identification of the sitter as a Xhosa male impossible to determine. Several monochromatic watercolours in sepia are also featured in the Campbell Smith Collection. Maseko’s choice of monochrome in these works implies the influence of Gerard Bhengu (qv. ), whose work he must have seen. Portrait of a man with a feathered headdress (plate 39), which is signed but not dated, makes use of several watercolour techniques ranging from pale washes in the background to darker ones in the wet-in-wet delineation of facial details. Contrasted to this is the use of a dry-brush technique to articulate the feathered headress and the fur on the garment the man is wearing. On the basis of these observations on the handling of the watercolour medium, it seems possible to attribute a similar but hitherto unidentified watercolour in the Campbell Smith Collection to Maseko. This is Portrait of a rickshaw man (plate 41) which is neither signed nor dated. Maseko later became a deacon in the Zionist Church and moved to Polokwane (Pietersburg) in Limpopo Province where he eventually died at the age of 67. Born at Boyne near Polokwane, 1927; died Polokwane, 1994. Training Secondary Education, largely self-taught; encouraged by John Koenakeefe Mohl (qv.). Exhibitions 1957: Open Show, Joubert Park, Johannesburg. 1963: Joint exhibition with John Mohl at the Apollo Gallery, Johannesburg. Exhibited regularly with Artists under the Sun at Zoo Lake, Johannesburg. Regular exhibitor, Amstel Art in the Park, Pietermaritzburg. Collections Killie Campbell Collections, University of Natal, Durban; Voortrekker Museum, Pretoria; Johannesburg Art Gallery; Boston Museum, Boston, USA. Johannesburg, in 1962. Source: “African Artists take their place in the Sun”. Zonk, July 1962, p. 15. Photographer unknown. Given that these two watercolours (plates 18–19) by Maseko are identical in date and size, this might suggest that they were intended as pendant portraits of a husband and wife. However, a closer look at them reveals subtly different approaches that mark them as being distinctly separate works. To a large degree Portrait of a Man conforms to the conventions of the ‘native study’ which was popular in South Africa among white artists in the first half of the twentieth century (see Constance Greaves, p.16). These conventions were emulated with greater humanity and insight by Mnguni (qv. ), Bhengu (qv.) and Pemba (qv.) even though their work was largely intended for a white colonial and tourist market. Although there may well have been an actual sitter for the male portrait, it seems to embody a ‘type’ in the hands of an artist well-versed in his idiom rather than the specifics of an actual individual. Portrait of a Woman, on the other hand, defies categorisation as a ‘native study’ in that the sitter is not garbed in traditional attire, but presents herself as a member of the aspirant black middle class. She exudes a confident personality. Maseko’s handling of watercolour is worth noting here. His earlier activity as a painter of designs on scarves prior to his discovery by John Koenakeefe Mohl (qv.) seems relevant. In Portrait of a Woman he uses only two colours combined with black line to remarkable effect. This, as well as his treatment of drapery with a direct and fluid simplicity is typical of a painter well-versed in working on absorbent fabric. Both of these works just predate Maseko’s 1963 joint exhibition with Mohl at Johannesburg’s Apollo Gallery, and are from a period immediately prior to his working under Mohl’s tutelage during which he was introduced to the materials and techniques of painting in a more serious manner.